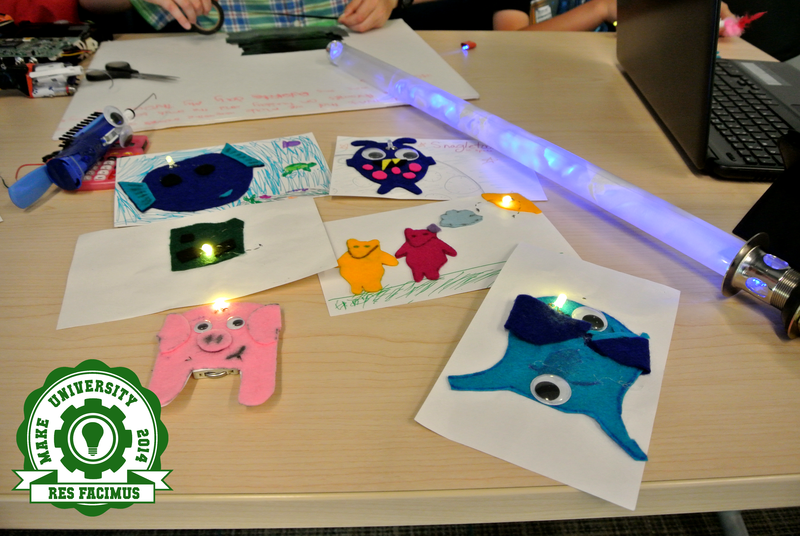 Between June 2nd through June 6th the MakerBus team was in beautiful Victoria BC offering a one-week kids camp called Make University (Make U). Now you may be wondering what our team was doing so far from our home in London, Ontario and the answer is a somewhat long one. In short, each year the University of Victoria hosts the Digital Humanities Summer Institute (or DHSI). The “DH” in DHMakerBus stands for “Digital Humanities,” an emerging field that blends new media, social media, and computer science with the traditional humanities subjects (i.e. history, english, philosophy, etc.). DHSI is aimed mostly at scholars, students, and librarians, but they are interested in offering course for younger learners as well. Kim (Chief Instigator at the MakerBus) has contact with a project called Eurekamp at the University of Alberta. Eurekamp was born from a partnership between the Faculty of Arts at U of A and an organization called Philosophy for Children. Philosophy for Children seeks to promote philosophy and to “develop critical thinking skills, creativity, and caring communities through philosophical inquiry programs.” Kim’s contacts at Philosophy for Children wondered if the MakerBus would like to partner with their organization to create a summer camp that blended philosophy with maker culture. Together we pitched the idea to the organizers of DHSI and Make U was born! At Make U we wanted to get kids thinking with their hands and with their minds. It’s easy to show someone how to make something, but it’s an entirely different exercise to get people thinking about the act of making itself. Each day we concluded Make U with a group discussion where the campers created big picture questions and we discussed their ideas. At the end of the first day, one camper asked, “why do we enjoy taking apart things even if they already work?” This was a brilliant question that we talked about for nearly an hour without coming to a definitive conclusion – but that’s what philosophy is all about, asking big questions and not worrying about wrapping things up neatly with a single answer. With five days of activities and four camp leaders we generated a lot of content (I personally took 6.8 gigs of photos of videos), so we’re going to be blogging, tweeting, and Facebooking some of our highlights throughout the coming month. We can’t wait to share our Victorian adventures with you! So happy to see the soft circuits on the road! This looks great and I look forward to seeing more pics. Will MakeU be at DHSI 2015, or was this a one-time thing? Our team is just working out the logistics of offering MakeU again for 2015. We would very much like to run it again, but we just have a few details to work out. Look for confirmation hopefully before the end of the month.